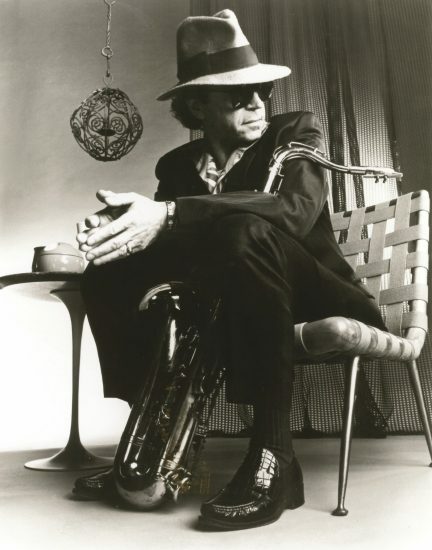 To say that I knew Gato Barbieri in a personal way would be an exaggeration—I spent some time with him one afternoon, poolside in San Juan, Puerto Rico. We were both there to perform at the Heineken Jazz Fest. It was June 2004, and I was playing with a salsa artist, the trombonist Jimmy Bosch. Gato was to perform the next day, and he was relaxing by the pool, though not in a very relaxed way; he was dressed in his classic attire—full black suit and hat. Gato is one of the most misunderstood figures in the saxophone world. In fact, among the current generation of saxophonists, his legacy is sometimes relegated to the image of the hugely successful creator of pop hits such as “Europa” and the theme to Last Tango in Paris. These songs, and others like them, became the instrumental saxophone hits of his generation and paved the way for many pop-saxophone idols to follow. But then there is the other Gato. He represents the generation of tenor saxophonists that directly followed the ecstatic and powerful sounds of late John Coltrane, Pharoah Sanders and Albert Ayler. His sound was a howl that came from the deepest parts of the human spirit, a howl that sounded with an elemental and archetypal vibration, and that howl resounded in me deeply. From a physical perspective, Gato’s command of the overtone series on the tenor saxophone was unparalleled. For proof, visit YouTube and pull up his performance of “Jabulani” with Abdullah Ibrahim’s group, from a German broadcast in 1968. You will see a man in total communion with his instrument, the tenor saxophone becoming a pure extension of his breath, his voice, his vibration. Listen to Confluence, his duo recording with Ibrahim, also recorded in 1968, and you will hear two great improvisers blurring all the lines between what might be defined as “folk music,” “jazz” and “new music.” You will hear the complete communion of two spirits in sound. This blend of popular and esoteric genres is a hallmark of the work that Gato and kindred spirits like Don Cherry were doing, and it was happening long before the concept of “world music” was a thing. How then, are we to understand the seemingly sudden shift in artistic direction in the early to mid-1970s, when Gato’s attentions turned from the ecstatic to the more contained popular expression that garnered him so much commercial success? I myself have struggled with this, thinking for a time that Gato had chosen this direction simply to reach a larger audience. But now, having hopefully gained a small amount of maturity myself, I can hear “Europa” with new ears. The sound of Gato is there in full force, earth-shattering and vibrating with that archetypal howl—the same howl you hear on the seminal Cherry recording Complete Communion. That howl is something that seems to have gone out of fashion in the tenor saxophone world of late. Many young tenor players I hear now take a more refined approach, especially those who play the third octave of the instrument with a more delicate sound. Gato’s sound throughout his life always presented a more primordial vibration—the vibration of Sidney Bechet, the vibration of Illinois Jacquet, the vibration of Albert Ayler (who received some of the same unjustified criticism following his later R&B-inflected recording, New Grass). I aspire to connect with that archetypal howl in my own music, and I am continually amazed and inspired by the vibrations that Gato brought to this world. That day in 2004, I took to the stage with my great friend Jimmy Bosch, playing for a large, enthusiastic audience in a popular musical language but aspiring to the sound of that mysterious gentleman I had met by the pool.